Vitamin C is a powerful anti oxidant. It can fight off free radials caused by the environment which can cause premature ageing and dull skin. It helps brighten and smooth the skin. Because it's brightening it can also fade pigmentation and marks. Research has suggested that it's best to use Vitamin C in serum, because this penetrated the skin deeper and will have a greater effect. So look for those ingredients in a serum form! Vitamin C is advised for dull, tired and pigmentation issues. So I think a treatment would be the best way to use it. I have dehydrated skin and products that contain Vitamin C work brilliantly on me with no problems. I've been trying to find skin types and who would benefit from Vitamin C but I can't seem to find anything. So I think if you use it along side products for your skin type it should be fine. Please remember I'm not an expert though! As with any skincare ingredient there are some precautions. It can increase the skins sensitivity to the sun so an SPF is recommended. If you're using AHA, BHA or Rentinol I probably wouldn't use these all together or in a close time frame as all these ingredients increase the skins sensitivity so it may burn or sting. That being said it's a great affordable, accessible ingredient that really does work. This offering from The Ordinary contains pure L-ascorbic acid in a powder form, which is said to be the best way. And you definitely feel the powder in this serum. It feels almost dry! This also tingles slightly when I apply, nothing uncomfortable, it just feels like it's working! This is a serum so I use before moisturiser. And this definitely brightens my skin! I like to use it at night and in the morning my skin looks brighter and feels so smooth. I've been using this for a few months now and I haven't noticed a dramatic change in my pigmentation issue but I can forgive that because I love the results. This is very similar to the The Ordinary, it has the same texture and contains Hyluronic Acid too. So not only does this brighten, it hydrates. This also brightens and smooths my skin. Although it's very similar to The Ordinary one I think I like this one a little bit more. I found it more gentle, it doesn't sting on application but still has the same brilliant brightening and smoothing results! I like to use this in the evening (when I'm not using any other AHA treatments) and in the morning because it's hydrating and instantly leaves my skin smoother. This is definitely one to check out. This is a slightly different Vitamin C option. It's a liquid peel. That is applied and gently rubbed to lift away pollutants and dead skin. This is quite liquid and when applied and rubbed in it bunches up, like horrible moisturisers and primers do. But this is a good thing because it means it's lifting away impurities and dead skin cells. After doing this my skin instantly looks brighter, fresher and feels softer. This is to be used 2-3 times and clean skin. This is a nice little mid-week pick me up treatment! As I've said before. I am no skincare expert, it's just something that really interests me! 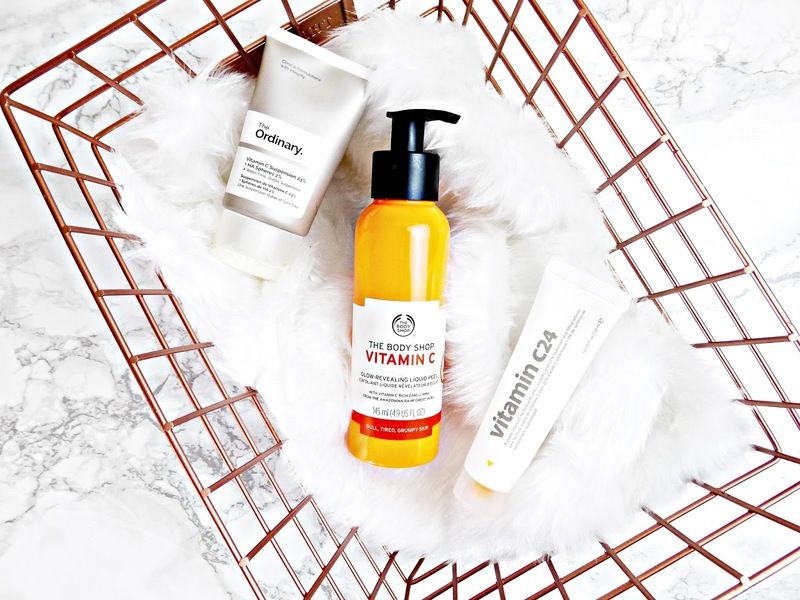 Have you tried any Vitamin C products? What are your thoughts?